Firearm Competency means that you have been found to be competent to own a firearm by the SAPS in accordance with the stipulations of Chapter 5 of Act 60 of 2000 as amended. You might want to ascertain yourself with the description of domestic violence, which is an important personal issue the SAPS will look at in your specific situation before they will award a compet ency certificate to legally own firearms. Before one may apply for a new firearm licence, one must first be declared competent to own such a firearm. One must complete proficiency training with a training provider in the following Unit Standards as explained in the SAPS Directive 27/1/1 dated 10-01-2017 and signed by Major General JJ Bothma, before one can apply to be declared competent to own a firearm. Persons under 21 years of age may apply to be declared competent to own firearms, if they complete the above training in the unit standards they chose, and also hold dedicated status with an accredited association (either hunting and/or sport shooting association). Competency certificates are issued per category of firearm, i.e. for a handgun, for a self-loading (semi-auto) rifle, for a manually operated rifle (i.e. a rifle with a bolt, lever action, falling block, pump action), and for a shotgun (either break-neck, bolt operated, pump action or semi-auto shotgun). 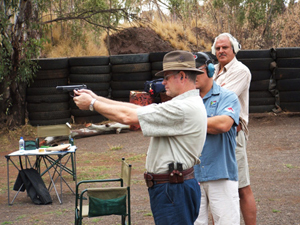 Although a competency certificate may be issued to a person for a handgun, rifle, shotgun and semi-auto rifle, all printed on one document, each category of firearm has its own competency, which correlates directly with the length of validity of the licence of said firearm (thus relevant to the Section the licence was issued under). Note: You are not allowed to do business (i.e. PH work) with a rifle you have licensed under Sections 15 or 16. Because it takes time to issue a competency certificate, you use the time to complete your motivation(s) and collect all relevant documentation you would want to attach to your licence applications – get proof of membership of associations or clubs, get endorsements, etc. If you are under the age of 21, you may apply to be declared competent to own firearms. You will, however, first have to do proficiency training and acquire dedicated status from an accredited hunting and/or sport shooting association (such as NHSA), before you can apply to be declared competent to own firearms. Once you have competency, you can apply for a licence for a firearm for which you have competency. You have to, according to the FCA, renew your competency 90 days before it expires. However, this has become a grey area in SAPS’s implementation of the FCA, and it is advised that members contact the office in this regard if they are uncertain. You MUST read the NHSA Newsletter Vol. 13 (04) of 22-01-2017 in this regard.